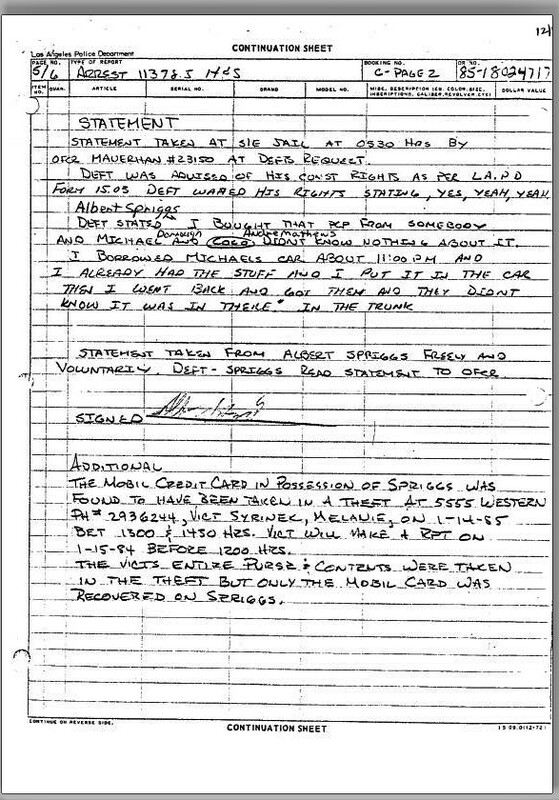 My hope is that by providing you with an explanation of the significance of the attached police report (see Document-A-E-Spriggs-ArrestReport-1985), it will make it possible for us to see that law enforcement was simply determined to make sure that i was removed from the street. The attached police report is for a guy whom i had known named Eithon Albert Spriggs. He, i, and another person were arrested on a narcotics on January 15th, 1985, in the Nickerson Garden Housing Projects in Los Angeles. Mr Spriggs had asked me to give him a ride home and he would pay for the gas. I let Mr Spriggs use my car for that purpose (to go and get ome gas). When Mr Spriggs returned, as we were about to enter the car to leace, the police approached us, made us place our hands on the car, and they searched us. They searched the car and found nothing. The police claimed that they smelled narcotics coming from the area of the trunk of the car. And the officer claimed that he smelled the odor of drugs (PCP) on me. (If we assume that the officer’s version of events are true, then the smell of PCP should have been strong on the passanger in the rear seat of the car, which was Spriggs. No mention is made of this in the report). I cooperated with the police to search the car, including the search of the trunk, because I knew that nothing was in the trunk of the car. However, the search of the trunk did result in a lemon juice bottle being found in the trunk of the car, which contained PCP. Spriggs, another passenger, Andre Matthews, and I were arrested. During the interrogation by the police, Spriggs confessed to the police that he had purchased the drugs and put it in the trunk of my car without my knowledge. (The confession is on page 12 of the Document-A-E-Spriggs-ArrestReport-1985). At the time of arrest, both Spriggs, and the other passenger, Matthews, were on parole, and their arrest, ordinarily, would have resulted in their having parole holds placed on them. Particularly Spriggs, in light of his confession. No parole holds were placed on them. And they were released three (3) days later. A bail was set for me at twenty-thousand dollars. However, at my arraignment in municipal court, I informed my appointed attorney of Spriggs’ confession, and upon reading it, he informed the judge. As a result, my bail was reduced to one thousand dollars.The judge and my mother also knew one another and the judge explained to my mother that, based on the confession of Spriggs, it looked like the wrong person was arrested for the narcotics charge. In spite of this overwhelming evidence of my innocence, I was convicted in a trial by judge. I was convicted based on the testimony of the arresting officer. 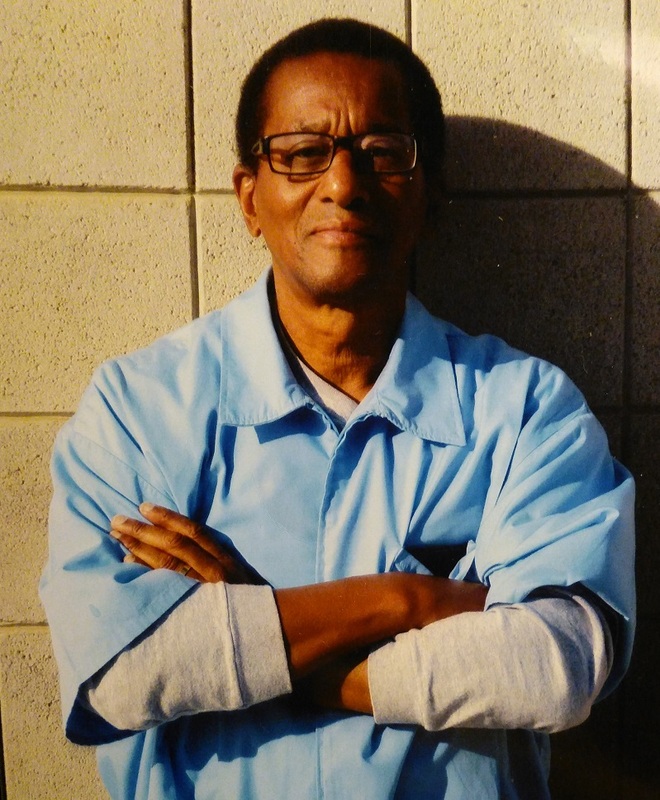 Spriggs had initially agreed to testify on my behalf that the narcotics belonged to him, but he was told by his parole officer, more than two (2) years later, that if he testified on my behalf, Spriggs’ parole would be violated. The District Attorney’s office, and specifically the prosecuting District Attorney Richard Klink, (who was also the prosecuting District Attorney on my murder conviction) contacted Spriggs’ parole officer and made him aware of Spriggs’ confession and testimony. According to the prosecuting District Attorney, Spriggs told him and his parole officer that I threatened to kill him if he did not confess to the drugs being his. There were never any fingerprints taken from the bottle that the drugs were supposed to be in. This would have been the best way to determine who had possession of the bottle and drugs. (Ironically, the bottle and drugs came up missing when I got to my preliminary hearing). I did testify at trial, and when I mentioned Spriggs’ confession, the trial judge said that she knew nothing of Spriggs’ confession. I cannot fight this alone – no one can.